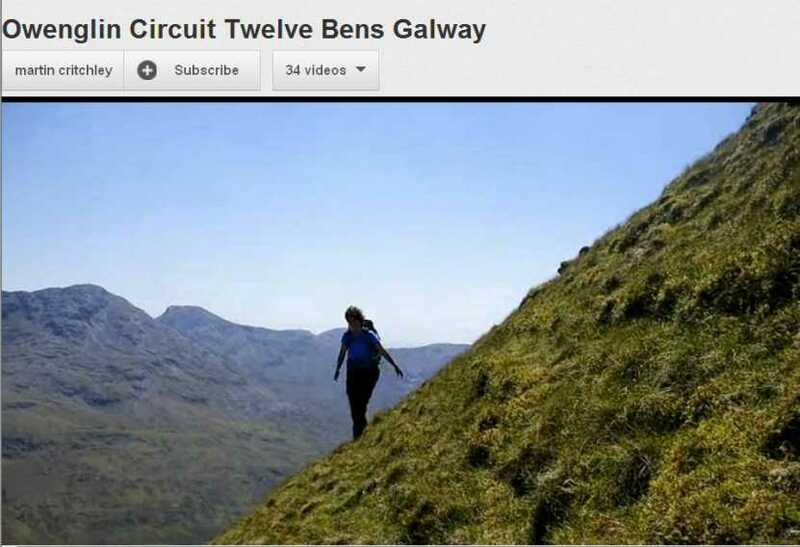 Five months ago mcrtchly and kernowclimber uploaded their super video "Owenglin Circuit Twelve Bens Galway". I love it . I also love the fact that on average it has been viewed 100 times a month. That's the beauty of YouTube. I magine making your mountain movie and hiring the village hall and putting posters up and so forth. Could you get 100 people into the hall...once...never mind once a month? Hardly. Thanks to the age in which we live we have enthusiasts making high quality low budget movies accessible to all. Its a great way for supporters of minority sports to stay in touch - just like here on MountainViews I suppose. And there are refinements you can bring to the published product. One of the fun things you can do is to run two YouTube videos simultaneously in order to watch the images from one with the sound of the other. Which brings me to the point. After a few beers this evening I tried out various audio dubbings on the Owenglin masterpiece. I usually use classical pieces but this evening I tried A-ha "Take on Me". In my opinion it works magnificiently. Try it! Open the two videos listed underneath, mute the sound on the Owenglin film, run it past the map section at the beginning, and then let the sound rip on the A-ha video. Somehow the lively music chimes magnificently with the pep in their steps approach of our two walkers.